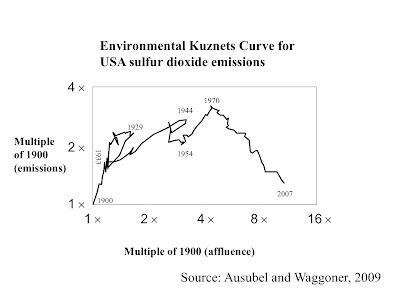 The chart, from J. Ausubel and P.Waggoner, 2009, shows peaks in 1929, 1945 and 1970. I can think of plausible reasons for each peak. Industrial production collapsed after the stock market crash of 1929. Production was ramped up during World War II, when smokestacks were seen as a good thing. 1970 marked the beginning of the environmental movement, including the first Earth Day and the creation of the U.S. Environmental Protection Agency.